Labour Day, International Workers Day or May Day nowadays is commonly recognised as commemorating the achievements of the labour movement. It occurs on 1st May, this being the date the American Federation of Organised Trades and Labour Unions demanded an eight hour workday back in 1884. Ironically Labour Day is observed on 1st September in the USA. In the 20th century the holiday began to be celebrated as the Day of the International Solidarity of Workers in the Soviet Union. 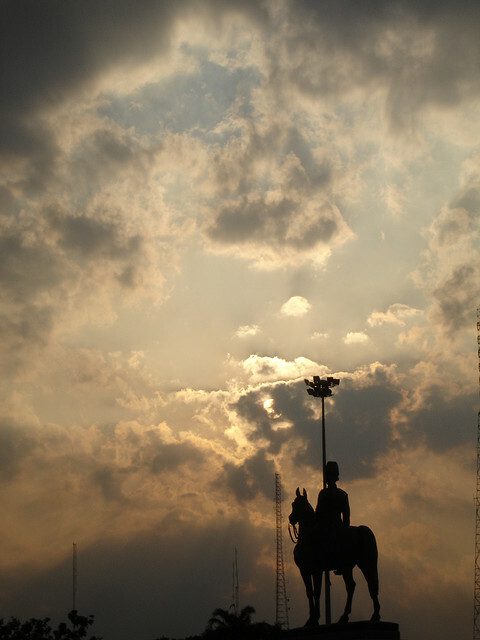 October 23rd is a National holiday commemorating the death of King Chulalongkorn (Rama V). He was one of the greatest and most revered Kings the country has ever had. His largest achievements being the abolishment of slavery and saving Siam from Western colonisation. His lasting impact is easily visible on the reverse of 100 Baht note. On the right you can see him fully dressed in his Navy Uniform. On the left, a depiction of him abolishing slavery in all forms. 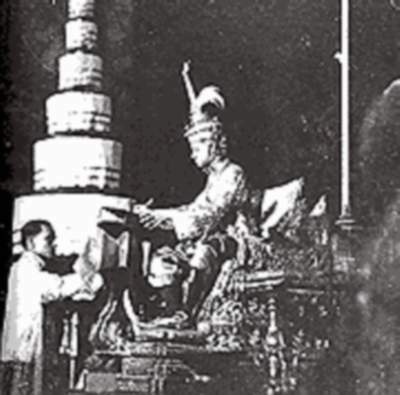 Known as the Royal Buddha, King Chulalongkorn was truly a King of the people. Although Siam didn’t officially become the Kingdom of Thailand until 1939, the borders of the country were very much shaped by King Chulalongkorn. 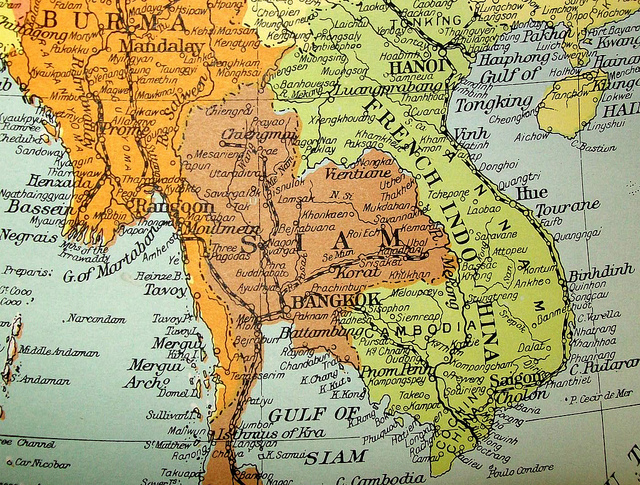 Siam was a much larger area than Thailand and encompassed much of Laos, Cambodia and even parts of Myanmar. As Western Colonisation began to encroach on all fronts, the King saw he needed to take drastic actions to prevent his country being lost to the West. He need to unite the people and play the West at their own game; politics. The first territorial cession of Siam came in 1863, when the King of Cambodia put his country under French protectorate. However, the French took a little bit more than they should. Some areas, including Siem Reap (Angkor Wat) were actually part of Siam. But the French refused to leave. In order to prevent the West from controlling his country, King Chulalongkorn knew he needed to embrace certain elements of the West. He was the first king to send his Princes to a Western education. He himself travelled much of Europe to learn the ways of the West. After the clear defeat from French Gunboats, he reformed the Navy by hiring the Danish Naval Officer Andreas Richelieu. Incidentally, This is where the name Richelieu Rock comes from. Richelieu Rock is a Mecca of a dive site known to Scuba Divers worldwide. Chulalongkorn split his country into official provinces which were all overseen and ultimately run by a central authority. This essentially removed local dynasties and united the country in a way more recognisable and acceptable to Western ideals. He modernised the army by introducing military conscriptions and established a defence ministry. he started to build the railways so he could easily keep eyes everywhere. He built Siam’s first Power plants. King Chulalongkorn was one of the greatest Kings Thailand has ever had. Around the country you can see statues and images of him. Just take a peek at the back of the 100 Baht note. There is a University (pictured above) and a large pavilion name after him. 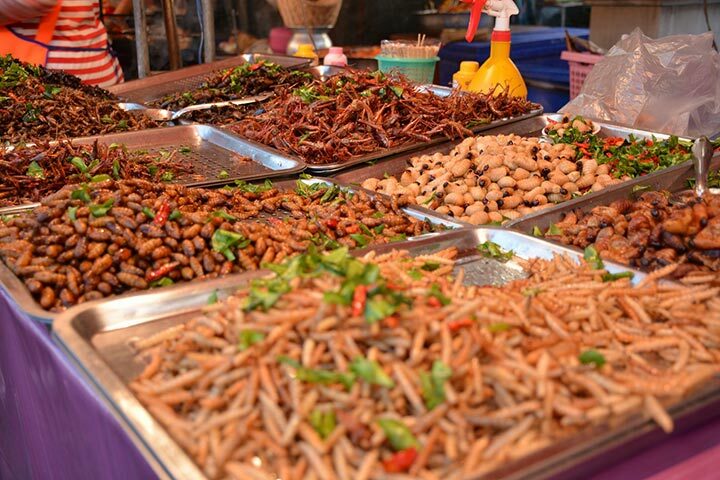 Then of course, October 23rd, is a national Thai holiday. This seems fair when you consider the massive positive impact he had on the country. It is fascinating to contemplate how different Thailand could have been if France had been allowed to move in. Khao Lak is not a big Party town like Phuket. It is a much more relaxed environment suitable for families and couples just looking for a break from the rat race. However, there are a few good party places to go for New Years Eve. Happy Snapper Bar in Khao Lak will be one of the busiest and it is always a good atmosphere with a live band and friendly staff. Beach Bar in Bang Niang is the closest you can get to a Koh Phang Ngan Beach party with louder dance music and plenty of merry drunk people. 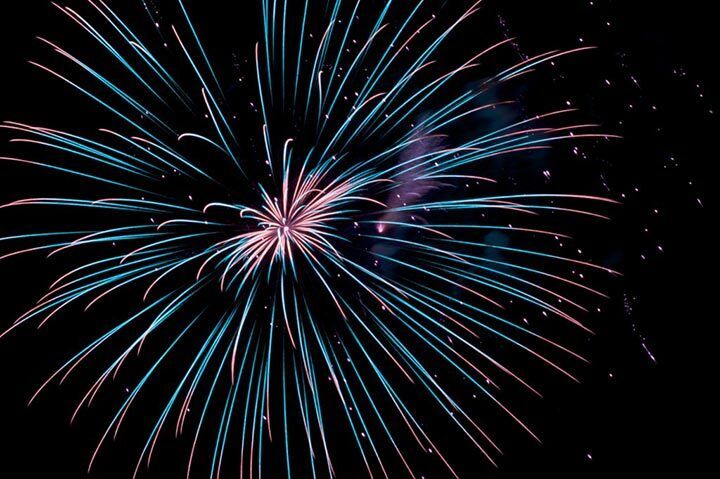 The Beach is also a good place to see any fireworks from any of the beach resorts. There are still lots of day trips running to the Similan and Surin Islands around New Years Eve, but the best way to do it is on a Liveaboard. Most boats moor up around Island 4 or Island 8 in the Similan Islands. 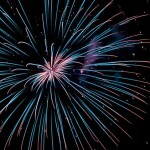 Most also have fireworks displays and lanterns. To be on a boat in the middle of beautiful tropical Islands for New Years Eve is a truly memorable experience. ALL Liveaboards in the Khao Lak area get fully booked very quickly. Book a long time in advance to secure your place for New Years Eve Scuba Diving. 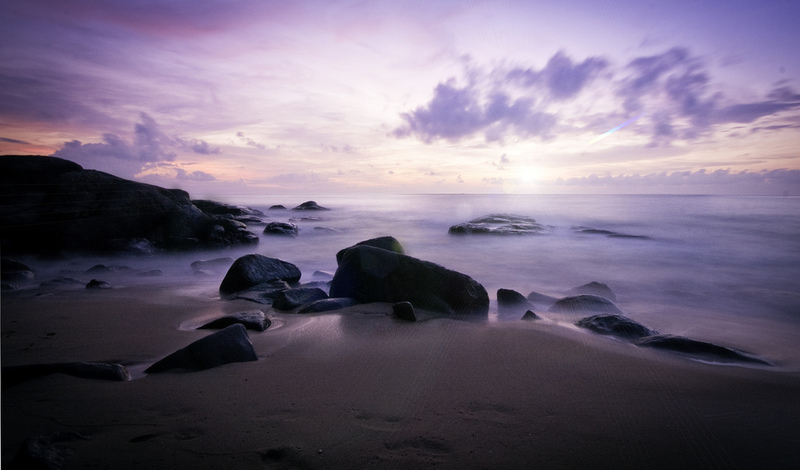 There are plenty of activities to do around Khao Lak’s National Parks, Waterfalls, mountains and beaches. Then take things easy with your family at one of Khao Lak’s many beautiful restaurants in the evening. New Years Eve doesn’t have to be so loud! Paying respect to the nine kings of the Chakri Dynasty. Chakri Day is a national holiday either celebrated on the 6th of April or the following Monday if it falls on a weekend. Government offices, schools and banks will be closed, but for all tourist businesses things will be running as usual. Alcohol sales are not prohibited. 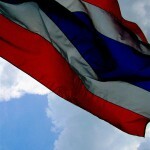 If you have spent even a single day in Thailand you will probably soon realise how well revered the King of Thailand is. There are images and tributes to him in every house, every business building and just about anywhere you care to look. If you go to the cinema, make sure you stand up for the National anthem! This respect for the King of Thailand goes back a long way. 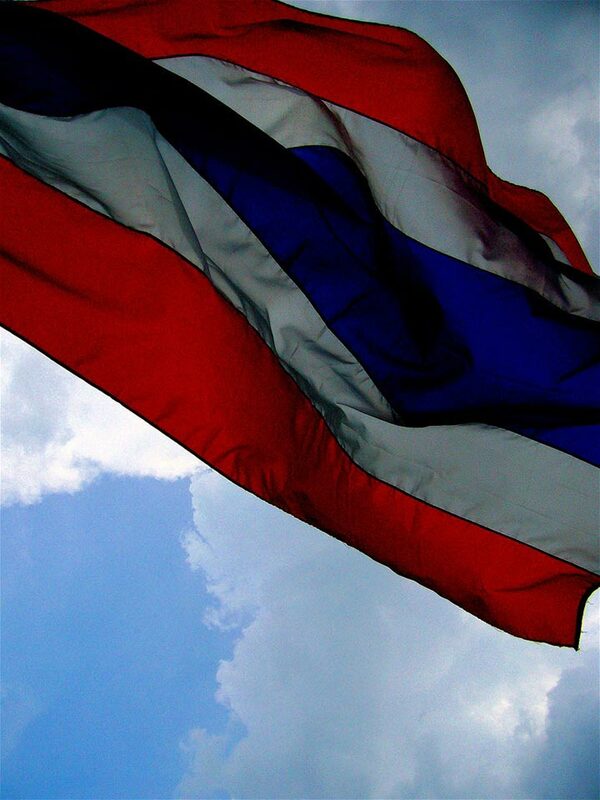 The current king of Thailand is the ninth in the Chakri Dynasty and today is a day to remember them all. 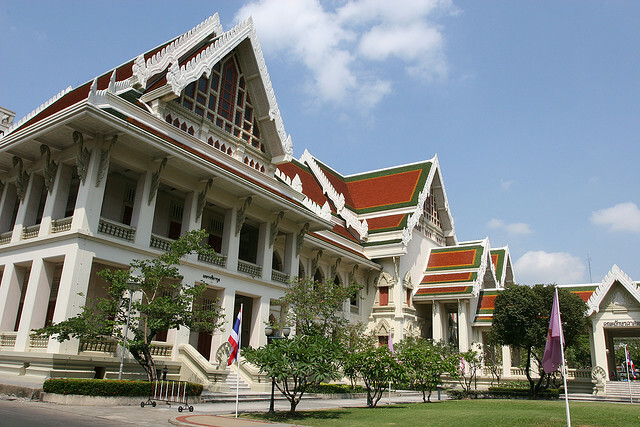 The Chakri Dynasty was founded by King Rama I in 1782 and the capital of Siam shifted to Krung Thep (modern day Bangkok). 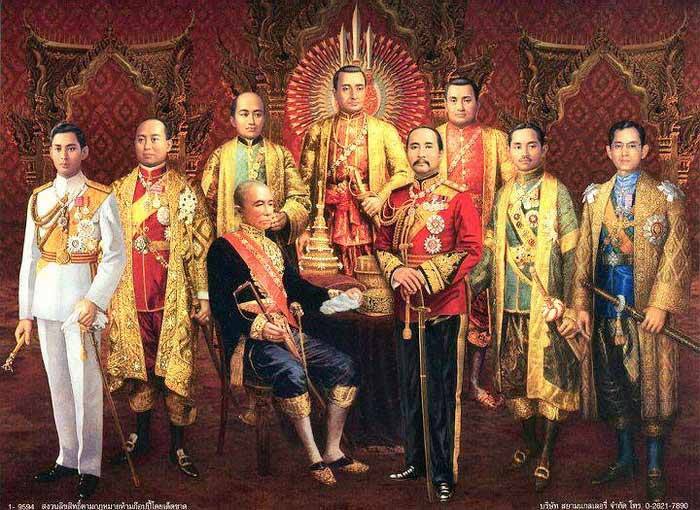 King Rama I was a military leader and before the founding of the dynasty he held the position of civil chancellor, referred to at the time as the ‘Chakri’. After founding the Dynasty he took this name with him. The Chakri emblem is formed of two intertwined weapons, the Chakra (discus) and the Trisula (trident). The word Chakri derives from Sanskrit and means the ‘Wielder of the discus’. 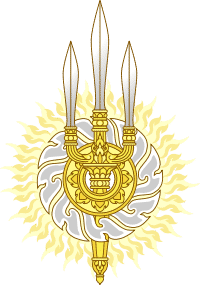 The Trident at the centre of the Chakri Dynasty emblem was the weapon of choice for the God Narayana, of which the Thai sovereign is meant to be an incarnation. Get ready for the wettest New Year on the planet, Sawatdee Pii Mai ! The Songkran Festival is celebrated from 13th to 15th April and is the traditional New Year’s Day in Thailand. Extra public and government holidays may be added either side of the official dates too. Songkran is a Sanskrit wording meaning the passage of the sun from one Zodiac sign to another. Though there are twelve such passing from one Zodiac sign to another during the year, or twelve Songkrans, the significant one is when the sun enters Aries the Ram. 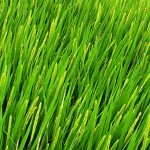 Sometimes this is referred to as the Major Songkran but commonly known as the Songkran Festival. Songkran also falls closely to the Vernal Equinox and has been commonly celebrated in the past. 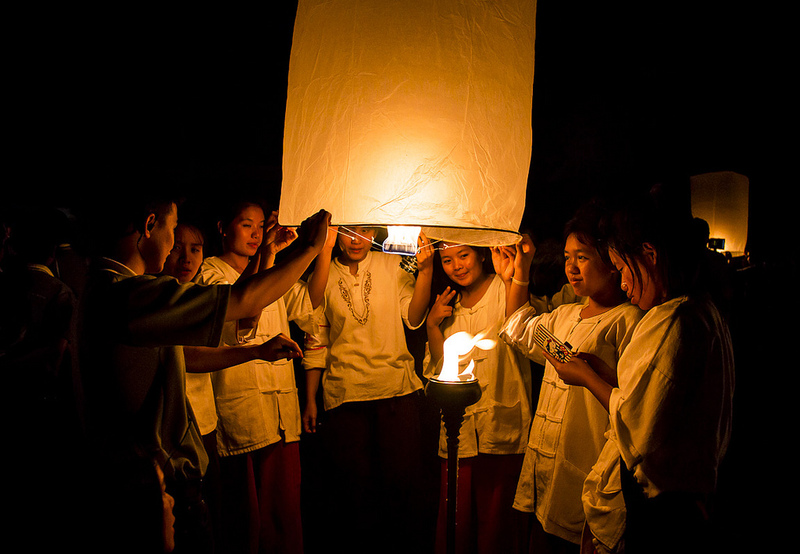 Indeed the Thai New Year is similar to the Holi Festival celebrated in India, Ching Ming as celebrated in China and even Easter as celebrated by Christians. 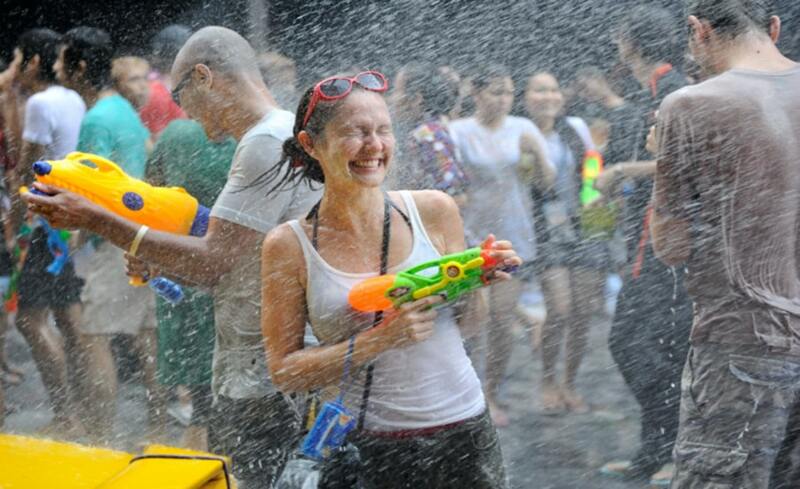 Songkran now falls annually on 13th April but originally the date would have been set by astrological calculations. It was the official New Year until 1888, then up until 1940 New year was celebrated on the 1st April before finally switching to 1st January. Songkran or Thai Water Festival as it is commonly known nowadays involves either walking the streets and having water fights with water guns and any type of water container or standing standing at the side of the road to soak those walking about. Throwing water around comes as a welcome relief to the April heat, the hottest month of the year in Thailand. Songkran is easily marked as one of the most fun days on the Thai calendar though it’s roots would have been more of a spiritual and physical spring cleaning. 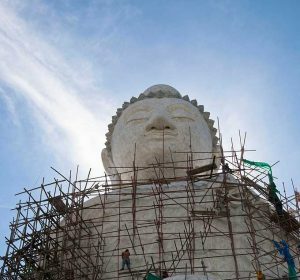 Part of the ritual of Songkran is the cleaning of Buddha images and then using the blessed water from the cleaning to soak other people as a way of paying respect and to bring about good fortune. As well as a good soaking you may also get white powder (nowadays commonly talcum powder) rubbed on your cheeks, a custom originating from monks using chalk to mark blessings. This is also similar to the celebrations of Holi in India. No matter where you go in Khao Lak be prepared to get soaked. Then continually soaked and soaked for the entire day. There is no escaping it and everyone will take great delight in soaking someone who is trying to stay dry. In recent years there is a large foam party held underneath constant water sprinklers on the main road in Bang Niang, opposite Riverside Guest House. The party is accomanied by live music and regular extra soakings by the local fire brigade. If you are heading out with anything valuable like a phone or camera, make sure they are well sealed in a waterproof bag.